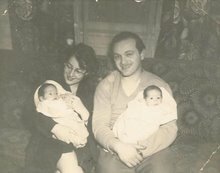 1951 Born in lull 'tween winter storms with twin bro' Dave. 1954 Want to write, ask Mom for letter to copy, meaning postal article. She misunderstands, gives me two letters: the word is. 1956 With Dad at river bank see animal tracks. Imitate with stick in sand. Seeing levelled sand heart sunk. Looking up saw someone splashed red and yellow paint on bridge's buttress. Decide to paint when grown. 1957 School daze. Perceived numbers as cartoons of kids. Parents deeply worried, explain symbols. 1958 Sister Trudy born. Father dies. Deeply impressed by idea of God. Decide to become God when grown. Or invisible anyway. Played with mud and finger paint. 1963 Exit Hebrew school, into the secular. Dance, romance. Mother dies. Childhood ends. 1964 Anglican Boarding school, Victoria, B.C.. Painful. Begin to write poetry, a lifelong love. 1969 Meet future wife, pass love-lettered spring holding breath, followed by summer perfect to boredom. Stumble 'to basement: hand and Eye Spy paint, hand finds bru--...a piece of p--...a jar of w--. ...fell into painting. 1971 Married in Calgary. Cross-Canada camping trip. 1973 Studied at Vancouver School of Art painting department (to '77). 1974 Travelled to London, Paris, Amsterdam and their museums. 1976 Co-founded the Vancouver School of Art Student Society and the Helen Pitt Gallery. 1979 First solo show of paintings: Kits House Gallery, Vancouver. Also Ridge Theatre Gallery. 1982 Exhibited at Surrey Art Gallery (Surrey, B.C. ): "Four Painters". First trip to New York city to see art. What that’s about? in front of Pollock. Then I see the couple barbequeing a man, a woman by the snow fence, ho-humming the autumn day. Right. Got it. Wow. Picasso: wall to wall human speaking flesh. 1984 Begin Limbo paintings. Write “Status Quo.” a broken-language poem. 1985 Begin ongoing series of drawings, Screen Paintings. 1986 Write a 45 page poem, Sweeney’s Barrels, in protest of Canada's last barrel factory’s expropriation. 1990 Move to Toronto. Begin “Roberta Drive” poems. 1991 Solo exhibition: Paintings & Drawings, Justina M. Barnicke Gallery, Hart House, University of Toronto. Reviewed in Globe & Mail. Exhibited at Art Dialogue Gallery. Begin to compose songs. 1992 Solo Show: The Overful. Also exhibited at Art Dialogue Gallery, the Attic Gallery. Began Blackboard Paintings. 1993 Solo show: The Overful. Also showed at Art Dialogue Gallery, Attic Gallery, M.T.C.V.A..Began Ravine paintings. Beging “Atlantic Avenue” poems. 1994 Solo Show: The Beauty Box. Also showed at the Art Gallery of Ontario Art Rental & Sales Gallery, Third Rail. Begin Open The Box. 1995 Solo Show: The Roastery. Also exhibited at the Art Gallery of Ontario Art Rental & Sales Gallery, Third Rail. Finish Open The Box. 1996 Solo show: Newman Gallery. Also exhibited at the Art Gallery of Ontario Art Rental & Sales Gallery. 1997 Solo shows: Liberty Street Café, The Rustic Cosmo Café. Also exhibited at the Art Gallery of Ontario Art Rental & Sales Gallery. Continue work on drawings. 1998 Group show: Gallery 1313. Also exhibited at the Art Gallery of Ontario Art Rental & Sales Gallery. Continue work on drawings. Join choir, sing baritone. 2000 Solo show Gallery 1313. The idea begins to occur to me that our ability to experience life is limited by the ways in which we can represent it. 2001 Bad year. Kidney failure, dialysis begins, thyroidectomy, start book called 11 Eaton South, a dialysis journal. 2002 Drafted by tenor section. Continue work on 11 Eaton South, begin Perseus Poems. 2003 Begin 8’x16’ painting. Heart attack. Up singing in 10 days. Resume work on painting. 2004 Begin to arrange music. 2005 Difficult year, then received a kidney transplant on my 54th birthday. 2006 Spent 2006 and part of 2007 rethinking painting. Whole new range of color and color relations. Become uninterested in composition and only in the relation of the relations of colors. 2008 Group show: 8 Artists for 2008 at John B. Aird Gallery where I show The Long Crossing for the first time.